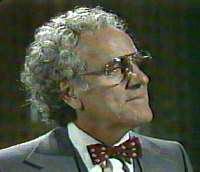 Portrayer: Fred J. Scollay, November 2, 1977 - December 26, 1980. Exit Scene: To Ada Hobson (RIP), in their kitchen, in response to her wishing him sweet dreams, "Okay." Date of Death: December 26, 1980. Cause of Death: Died in his sleep. Place of Death: His bedroom. Other Whereabouts: Fort Wayne (-1977). Relatives: Clarice Ewing, daughter. Denny Hobson, son. Leigh Hobson, son. Cory Ewing, grandson. Jeanne Ewing, granddaughter. Ada Hobson (RIP) (married on January 7, 1980. Dissolved in December 1980). Former Occupations: Traveling salesman. Owned Charlie's Fix-it Shop. Partner in Hobson-Frame Furniture.